Hi! For those that don’t know me, my name is Christian Tujo. I was born and raised in Portland, Oregon. I’m currently working as a Financial Advisor in Bend, Oregon, where I also do volunteer work for the Central Oregon Veterans Ranch. I have a beautiful daughter, Alexis, who has embraced water sports just as her Dad does. Alexis is a tremendously talented breaststroker for Bend Swim Club who also plays Water Polo for the Bend Waves Club. My Wife, Alicia was born in Jasper, Indiana, and attended Indiana University. Alicia is an avid runner and has qualified for the Boston Marathon on several occasions. My family loves the outdoors and adventure here in Bend. We have hiked to the top of several of the mountains here with our two faithful Labradors, Rocky and Abby! I attended the Virginia Military Institute where I played Division 1 Baseball. A lefty pitcher with a few tricks up my sleeve, helped to pay for my college! I loved playing baseball, especially when it came down to a bases loaded situation with the game on the line! After graduating from the Virginia Military Institute in 1994, I was commissioned as an officer in the Air Force. I worked as a Logistics and Mobility officer at many locations across the world. Serving my country was one of the most important and rewarding jobs I could ever hope for! After my active duty service, I returned to Portland and began a career as a Financial Advisor. My first 3 years in the business saw many challenging times including 911 and the tech wreck of 2001; however, I managed to survive and developed a rewarding business. My favorite aspect as a Financial Advisor is the relationships I build with my clients. While in Portland I continued my military career as a reserve officer with the 939th Rescue Wing at the Portland IAP. Realizing that my heart was in the mountains, we moved to Central Oregon in 2005. Alicia and I got married, and Alexis was born, all in the same month!! I started swimming at the age of 5 for the Portland Parks Swim Team, where I was one of the founding swimmers. My brothers and I embraced the sport, and the competition ensued! At the age of eight, I won my first Columbia Basin Swim League Title in the 25 butterfly, which made my coach, Mary Goar, very happy, and also enticed her to start challenging me more in practice! 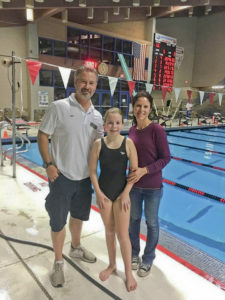 Over my age group career I managed to be successful at the short axis strokes, butterfly and breaststroke, qualifying for regionals and zone meets. That is where I saw this name on a heat sheet: Can Ergenekan. Can was a name that I would never forget. He was always in the last heat at every meet, a dominator of sorts! I never met him during age group swimming, but the name surfaced again in Masters Swimming. I would come to learn Can was actually pronounced Jon. Can and I would become good friends while training at the Multnomah Athletic Club. He motivated me to become a better swimmer and pushed me to swim faster during the dreaded postal events! While in Bend I embraced Triathlons, and over a 5 year stretch, I competed in several Iron Man 70.3 races, along with many of the other great races Bend has to offer. The culmination race for me was the Lead Man Ultra Tri here in Bend: 2.5 mile swim, 137 mile bike (including a double summit of Mt Bachelor) and a ½ marathon! After that race, I decided a 14 hour race was a little long!! While training for Triathlons I met a man named Bob Bruce. He was the Masters coach at the time, and a swimming genius and advocate. He was also very persistent about getting me into Masters Swimming competition. Eventually, I submitted and began competing for the Central Oregon Masters. Bob taught me how to be a better swimmer especially in the long distance arena, teaching me how to swim with my noggin as opposed to brute strength! I got better at the sport through the support of many amazing COMA swimmers. Masters swimming for me has brought about an increased fitness level and many great relationships. I would encourage any and all Oregonians to swim with a Masters team. You’ll be happy that you did! !